DIFFERENT REPORTING. Mail didn't have name or photograph. Turkish papers, evidently better briefed, had both, and claimed to know whom arrested Brit had been working for. What is the score with Steve Kaszynski, the British journalist arrested in Turkey over a month ago, and accused of links to a banned terrorist organisation? His arrest was reported somewhat inadequately in the British press at the time, and one or two people who knew him commented, though not saying much. With so much attention focused on the election in the past six weeks, and on the plight of refugees on the Med, as well as on police violence in the United States, I'm not complaining that the case of one man apparently caught up in Turkish conspiracies and state machinations has not been in the spotlight. But an online search brought up next to nothing in the British press, and no one has replied to an enquiry on Facebook I made. One website, taking its name though I suspect not its politics from the late peace campaigner Brian Haw, notes that the Daily Mail reported a British man had been arrested, but without managing to give either a name or a photograph. Turkish reports were supplied with both, and with the accusation that the arrested man had been no mere innocent astray, nor even a misguided revolutionist, but was a British agent, albeit working for the Bundesnachrichtendienst (BND), German intelligence service. From this the Haw site has woven a plot to divert attention from Turkey's involvement with Western powers and Israel in waging war on Syria, and a Gladio-style strategy of tension inside the country. I'm a bit dubious about neat conspiracy theories in which disparate pieces are made to fit, and more than dubious about this one. But I'm willing to think something 'funny' is going on. Incidentally one voice that was raised in defence of Steve Kaczynsky and those arrested with him was that of the hardline Republican Sinn Fein in Ireland, who reject the accomodation reached by the Provisionals with the British government. In a statement calling for the "release of arrested comrades in Turkey" the RSF said that in particular "Cihan Keskek and political activist Steve Kaczynski ... are close friends of the Republican Movement in Ireland. Steve is a regular reader of the republican monthly SAOIRSE. Only some weeks ago, Cihan and Steve met with a representative of Republican Sinn Féin." I have come across some of his contributions in left-wing publications, e.g. http://weeklyworker.co.uk/worker/365/political-prisoners-in-turkey/ and on websites. I would not have thought this branch of journalism, however good the work, pays very well. Not at all, in my experience. Published April 3, 2015 Turkish police detained Stephan Shak Kacynski, a British national of Polish origin, in operations against the terrorist organization DHKP-C in Istanbul on Thursday. He is accused of having close ties with the organization. 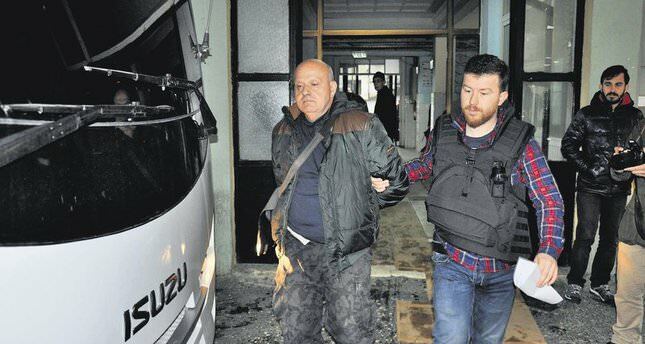 Among the suspects detained at the Turkish National Police's dawn raids at several locations in Istanbul on Thursday against the Revolutionary People's Liberation Party-Front (DHKP-C) was Stephan Shak Kacynski, a British national of Polish origin. The 52-year-old freelance journalist is accused of having links to the terrorist organization that killed a prosecutor on Tuesday and attacked a police headquarters on Wednesday. He was reportedly at the offices of İdil Culture Center associated with the group when he was detained by police. Speaking to Daily Sabah, officials from the British Embassy in Ankara stated that they "closely working with Turkish partners to tackle DHKP-C." However, no comments were made on the claims that the detained British national is allegedly a spy working for British intelligence. "We condemn group's acts of terrorism in Istanbul this week. Condolences to the family of the prosecutor Mehmet Selim Kiraz. We are aware of the detained British national and we are offering consular assistance to him," the statement added. Kacysnki, who occasionally writes articles on the terrorist organization on various websites, is a frequent traveler to Turkey. According to media outlets, he is a former member of the Communist Party of Great Britain, a Marxist-Leninist movement and he monitored the trial of an Austrian national accused of joining a DHKP-C rally for the Scottish Socialist Party. He was present as an observer on trials of DHKP-C members in the 1990s and early 2000s. Turkish media outlets, quoting intelligence sources, reported that Kacysnki was involved in the "activities" of the terrorist organization in Germany and Greece and often visited Istanbul and had contacts with various groups affiliated with the DHKP-C.
Turkish police had rounded up dozens of supporters of terrorist organizations in operations against the group in Istanbul and several other cities. Apart from Kacyznski, six senior figures of DHKP-C and members of a band known for its support of the terrorist organization, were detained in operations in Okmeydanı, a working-class neighborhood on Istanbul's European side. Okmeydanı is known as one of the strongholds of the DHKP-C and it is often the scene of violent riots by the organization's supporters. Along with suspects, police seized several weapons, ammunition and jammer devices. Turkish media reported that the raided places had tight security and police had to remove a set of 11 steel doors in one location to enter inside before the suspected militants burned or destroyed evidence that might link them to the organization. The terrorist organization is known for having support from abroad, especially from far-left organizations in Europe. The support from abroad for the DHKP-C is not confined to individuals. Greece and Syria, two neighbors of Turkey, is known for harboring members of terrorist organizations. Greece houses Lavrion, a refugee camp where the militants, treated as asylum seekers, are trained by senior leaders of the organization. Syria, where the terrorist group was founded in 1994, is also known for openly harboring militants, especially at a time of strained relations between Turkey and its southern neighbor. According to reports in the Turkish media, the DHKP-C has a "base" in Syria's coastal city of Latakia and supported by al-Mukhaberat, formidable intelligence service of the al-Assad regime. An article in the Yeni Şafak newspaper quoting intelligence sources says 52 DHKP-C members are trained at the base and Turkish intelligence suspects they may carry out attacks in Turkey. The article also points out that Mihraç Ural, a Turkey-born militant who heads a splinter group of a movement that the DHKP-C fell out with, now coordinates training of DHKP-C members in Syria. The investigation into Stephan Shak Kacynski, a British national of Polish origin, has revealed that the suspect who was recently detained under the scope of the DHKP-C probe is a spy working for Germany's Federal Intelligence Service Bundesnachrichtendienst (BND). Kacynski and several others were arrested under the scope of the DHKP-C operation on Saturday. According to reports, Kacynski was not only responsible for giving instructions to the terrorist organization and providing communications between the DHKP-C and BND, but was also responsible for providing funding from Europe. It was reported that he occasionally participated in protests organized by the terrorist organization and frequently contacted the organization in Istanbul. Stephan Shak Kacynski was among the suspects detained at the Turkish National Police's dawn raids at several locations in Istanbul on Thursday against the Revolutionary People's Liberation Party-Front (DHKP-C). This is not the first time that the finger of allegations has been pointed at one of Turkey's NATO allies. It was claimed that a Canadian intelligence agent was involved in helping British nationals cross into Syria to join ISIS. Whatever the truth of such allegations, or the Turkish government's motives for making them, it looks as though what is really happening in Turkey is more complicated than any conspiracy theory. Meanwhile, it is not just the established media that is being strangely quiet about this case. Hopefully as soon as parliament is back in business there will be questions asked. But also maybe friends on the Left, some of whom say they have met Steve Kaczynski and that he is a nice guy, will be raising calls for his release - and perhaps considering their own investigation? Is Your Vote Going to the Henry Jackson Society?